Since the Kuffar destroyed the Ottoman Khilafah (caliphate) by the hands of Mustafa Kamal, the English agent and their creation nearly 94 (Gregorian) years ago, and the Islamic Ummah has not seen any good, but instead, it has become at the tail of nations, living a bitter reality and living a life of humiliation, weakness and subordination; it is subject to the dictates of kufr and atheism supporters of all races and colour. And it continues to feed on the crumbs of the world’s tables, while it is still the targeted bawl of all nations from the East or the West. The loss of our status that the world feared, and the loss of Palestine, Iraq and others, and the dominance of the Kuffar over the Muslims everywhere, as in Palestine, Syria, East Turkistan, Myanmar and other Muslim countries, and the spread of poverty, hunger, unemployment, decline in values, morals and scientific and economic backwardness … are all the secretions and results of the absence of the Khilafah. The West’s thinking and culture, from democracy, capitalism, secularism and liberalism, controls all aspects of life, and the systems of government, legislation and laws, the economy and wealth, the education curricula and the media, and the lifestyles. In other words, the Muslim countries are under Western colonialism in all its forms, intellectual, political, economic, and military in several countries. The suffering of the Muslim Ummah from scourge and miserable conditions would not have existed if there was a power to stop it or object it. This deterring power can only be a great, sincere and an aware force from within the Ummah; a powerful system that puts an end to this injustice and aggression by cutting off its hand and removing its authority. And this system stems from the Islamic creed that came by revelation, which we are ordered to follow. Leaving it is considered to be a tyranny, and referring to others in judgement is Kufr, transgression or injustice, and referring to tyranny that we are ordered to disbelieve in it, whether the rulings related to man as an individual, like the rules of prayer, fasting or those related to the Ummah as a group, which are implemented through the state such as the penal systems, transactions, judiciary, economy, social, education, internal and external policies, treaties, wars, the enjoining of good and the forbidding of evil, and so on. All of this can be gathered under the system of the Islamic state, the Khilafah state; therefore, it is natural that it is said that the establishment of this state is the establishment of all the rules of Islam in the land; it is the mother of obligatory duties and the number one duty to work to establish it. What shows the Ummah’s thirst for Islam everywhere is that whenever Muslims have to nominate or choose between what is “Islamic” and others, in unions, associations or institutions, or others, the winner is the “Islamic” one. What happened in Tunisia, Egypt, Jordan and others are a proof. They express an Islamic awakening that makes the kafir West tremble in fear of the return of Islam to the arena of international conflict. It started fighting Muslims as “extremists, terrorists and fundamentalists”. 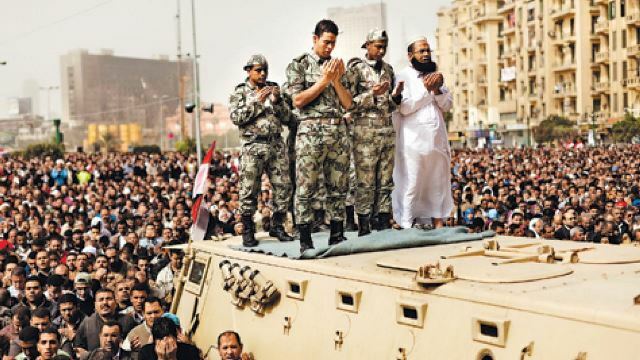 It is by Allah’s praise that the image of the Khilafah is more present than ever before. A large number wants and works to reclaim the glories of the past. They dream of Omar al-Farouq, Omar bin Abdul-Aziz, Salah ud-Din al-Ayyubi, Saqr Quraish, Harun Ar-Rashid,… etc. They yearn for pride, dignity, justice and strength until they return the best nation brought out to mankind. This promised Islamic state – the second Khilafah Rashida state on the method of Prophethood –is an ideological state whose constitution is derived from the Islamic creed, and the Muslims are entrusted with delivering this doctrine to all peoples and nations. The rule by Allah’s law will return, and the Book of Allah and the Sunnah of His Messenger ﷺ will return to be the Ummah’s reference in accordance to His (swt) saying: ﴿وَأَنِ احْكُمْ بَيْنَهُمْ بِمَا أَنْزَلَ اللَّهُ وَلَا تَتَّبِعْ أَهْوَاءَهُمْ وَاحْذَرْهُمْ أَنْ يَفْتِنُوكَ عَنْ بَعْضِ مَا أَنْزَلَ اللَّهُ إِلَيْكَ﴾ “And judge, [O Muhammad], between them by what Allah has revealed and do not follow their inclinations and beware of them, lest they tempt you away from some of what Allah has revealed to you.” [Al-MA’ida: 49]. We are saying how many of the straggled ones have been eaten since the destruction of the Khilafah; Palestine , Iraq , Kashmir, and East Turkestan have all straggled, and the list goes on. All of them will become a single state without borders and barriers, and the bond of the creed is the basis, and will replace the bonds patriotism, nationalism and other declined bonds. The cohesion of society, people and the state will increase. The Imam, the shield who is fought from behind will come, who will declare jihad to spread Islam in the entire world. And he mobilizes the armies to liberate the blessed land of Palestine and returns it to the heart of Islam and the Islamic state, the land of Isra and Mi’raj, the land of the Mahsher and Manshar (gathering and resurrection). The Jewish entity would not have existed on the land of Palestine if the Khilafah existed. We all know the position of the Khilafah during the time of the Ottomans and their refusal to relinquish it, even in its most vulnerable state. The Imam will protect Islam, will protect the Muslims everywhere, will repel the aggression and injustice and will save their lives, money and homes. The Islamic Ummah’s wealth, resources and money will return, which the Kuffar and their agents have looted under the sight and hearing of the Muslims. Its economy will thrive. Trade, industry, agriculture, various business and internal and external trade relations will all return. The Khalifah (Caliph) spends resources in the care of the affairs of the Ummah and its interests, so that people can live in abundance, prosperity, blessing and happiness. Ibn Khaldun mentioned in his introduction that what was carried to Bait ul Mal (treasury) of the Muslims in Baghdad during the days of the Abbasid Caliph al-Ma’mun is equivalent to 70 billion dollars and 1,700 tons of gold today. How would it be today if the Muslims had a Khilafah Rashida on the method of Prophethood and Allah (swt) blessed them with a Khalifah who feared Allah; will there remain in the house of Islam one poor person?! May Allah have mercy on the just Khalifah (Caliph) Umar bin Abdul Aziz, who under his Khilafah, Muslims did not find one poor person who deserves zakat. The rules of the Islamic economic system will be implemented and the banks of usury, monopoly, unemployment, favoritism and mediators will disappear, and everyone who has the right to work or entitled to a position will take it. Islam and the Islamic Ummah will reclaim their victory and glory and its scientific place at the forefront. Education will be available to all in all levels, not limited to the rich and the powerful. The state will have the scientific and technological superiority required for heavy industries, modern warfare and other aspects of life that will be used in the propagation of Islam. All this will only be achieved by the presence of a sincere Sultan (leader) to his Lord, keen on the interests of his Ummah, and this will be only be with the possession of quality technology and creative scientists. When there is a Khilafah state that sponsors creativity, Muslim scholars who immigrated to the West will return. The scientific and military superiority will return as it was in the past when Muslims were able to overcome the scientific and military superiority of the Romans and the Persians. After that, the Muslims were able to extract the resources in this land and discover the scientific laws governing them and achieved remarkable achievements in the field of medicine, engineering, astronomy, geography and others. Europe sent its students to receive the science from the Muslims. Allah’s rules and punishment laws will be implemented again. Anyone who transgress Allah’s limits will be punished. The misconceptions blurring the correct Islamic concepts will disappear; it was distorted by the West and its associates with the concepts of the rotten secular capitalist civilization. And the family unit and women will return to the true place given to them by Islam, which was distorted by the enemies of Islam smitten by the West’s culture, and they fooled the woman that she got her rights that Islam deprived her of, and that she achieved the achievements that Islam deprived her of, while the reality is the opposite; the decline and misery of the woman are caused by the abandonment of the rules of Islam and adopting the Western approach in the search for her rights. The Khilafah Rashida will protect the honour of the Ummah, and will protect women, and it will drive for her the armies. This is what the Messenger of Allah ﷺ did when a Jewish man attacked the Muslim woman’s dress, and it is what the Khalifah (Caliph) Al-Mu’tasim also did. The Khilafah Rashida is what protects the family and society from offence and corruption and will implement the social system and prevent immorality, obscenity, and mixing. It will prevent evil and violating of Allah’s laws or people’s rights. The khilafah will control the media and directs it to the public interest; it will close the satellite channels and programs of corrupting and corruption, and will monitor the internet sites and will prevent bad sites from the people. The sins and causes of corruption are only a direct result of the absence of the political entity that implements Allah’s law. The glory victory and protective shield of women is the Khilafah, the Khalifah is the guardian. The West’s fight against the Shariah dress and the laws of the social system are only a war against Islam.